So this book is large. 600 pages large. But it’s technically two stories in one, so 2 300 page books isn’t that bad when you think about it. What I really liked about this book is you not only get the authors (Darcy) perspective on what it’s like to be a young adult, or late teen, in the publishing world and the harsh reality that life can be. But you also get the story that she is writing. To start off with…it’s far fetched that a 17 year old girl got accepted to the first publishing house that she sent her manuscript to and heard back from them so quickly. Not to mention from what I know of the publishing industry that getting a $150,00 advance is unheard of for the first novel. I mean…how well do they really expect the book to do? Harry Potter good? I doubt it. My mom is an author. I know when she writes she likes to bounce ideas off of people. Or sometimes she would just be sitting on the couch and say something that popped into her head because it was a good idea. There is NO way that Darcy wrote a book about something that supposedly happened to someone her mother knew, and no one except her sister and friends knew about it. But so Darcy moves to New York City, and her agent lets her stay at her apartment for two weeks while she is out of town. And during this time she meets other authors. Ones she’s read. Ones that are debuting the same year as her. Ones she hasn’t heard of. She meets a girl, Imogen, they become great friends. Then more then friends. There are so much more unrealistic things about Darcy’s life. Like for the fact she found the apartment she wanted in less than a day. That she met the perfect girl for her. That she didn’t know she liked girls until she met this one. I mean, there had to be other girls that attracted her eye before? But she is only 18. Some people don’t realize until later in life. So I’ll forgo that little bit. Darcy is mostly whine whine whine, complain complain complain and spend spend spend that money. Her sister, a math genius, set her a budget. Does she stick to that budget? Of course not. She’s 18. Did anyone think she would stick to it? Cause I sure didn’t. A lot of Darcy’s story is about editing and how difficult it can be. I’ve never written a book, but I know that editing is difficult. You stress over every little thing trying to make it perfect before the book is released. It’s never perfect. There is always typos or some sort of grammar mistakes. That’s why you have people beta read. Which she had like 4 people do. I personally think she needed more than that. More of Darcy’s story is her eating noodles with Imogen and once again flushing her budget down the drain. Things that happened with Imogen: She moved in with Darcy pretty quickly. Her book wasn’t doing that great until it was caught on camera in some famous persons arm. Darcy broke her trust trying to find out her real name. They got back together. That’s really it of the whole Darcy story. But Darcy eventually goes back to the real world. She wakes up on the sidewalk as they are trying to revive her. When she gets to the hospital she is just waiting around after they checked her, and she sees this little boy, we later find out that he is a ghost. And that she can now see them. Her mother comes and gets her, obviously. And they decide to drive back, even though her mother hates to. They have a pretty good trip and no more ghost sightings so far. And then they get home. And she realizes there is a ghost in their house. I don’t remember ghost girls name. Let’s call her GG. K? So as it turns out GG was a friend of Lizzie’s mom when she was 11. This was before GG had been kidnapped, killed and buried in her own backyard. Yay. Murder. Boo there wasn’t more of it. Or even a good case to follow. Lizzie’s story was more of a romance then I wanted it to be honestly. Like why did Scott Westerfeld have to write TWO romances in the same damn 600 pages I was reading. Why couldn’t at least one have been a non-romancey story. Lizzie’s story easily could have done without it. I would have LOVED a story that just focused on her trying to help GG get over her fears over the bad man that hurt her, (which took Lizzie killing him to actually do). But it deals more with this romance thing that Lizzie is having with some Death God dude who apparently is shiney and lives in the Afterworlds because he doesn’t wanna age and forget his dead twin sister. So I mean, he has a good heart. But seriously. I’m getting sick of the romance stuff. Even though that’s half..ok more then half. Of what I actually read. I feel like Lizzie’s story didn’t really have an ending. Like Ok. She killed the guy that had hurt GG. And she and this Death God guy became a thing. But..it wasn’t a real clear and concise ending. There are bits and pieces I like in each story. And I would probably read the book again. But I would much rather it be two separate books. That way I don’t have to skip chapters if I just want to read Darcy’s story. Or if I just want to read Lizzie’s story. 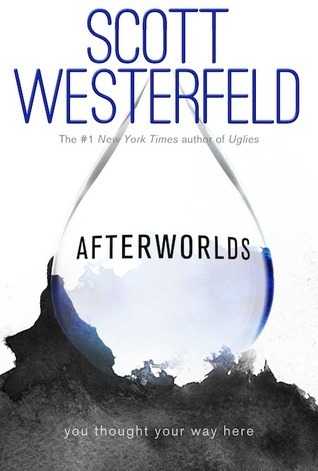 This entry was posted in Book Review and tagged afterworlds, author, book, book review, book reviewer, books, death, death god, god, new york city, paranormal, publishing, review, reviewer, scott westerfeld, young adult. Bookmark the permalink.